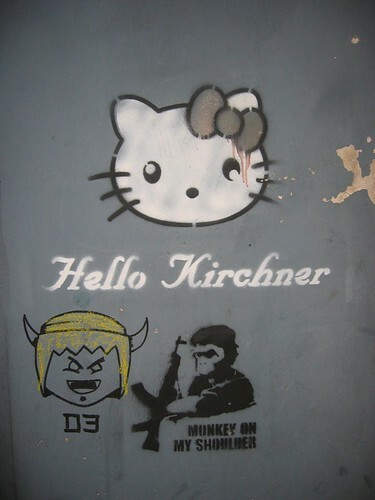 Hello Kirchner, originally uploaded by ultraclay!. Christina Fernandez de Kirchner was just elected President of Argentina. This was a topic of discussion on this afternoon’s Leonard Lopate Show on wnyc. Obviously the idea of a First Lady being elected to take her husband’s office is topical here in the US. But really, I just wanted an excuse to post this bit of graffiti I found last year in Buenos Aires. For a little more graffiti fun with the Kirchners, see Terminestor, a GOTD back in march.